When it comes to drinking milk, the date on the carton might not be as important as the freshness of the product inside. The date you find stamped on a milk bottle or carton is the "sell-by" date, and the milk inside still might be good for days after that date. However, if milk is handled incorrectly or stored in the refrigerator beyond the expiration date, the chances of it turning sour increase. If you drink milk past the expiration date, you run the risk of developing food poisoning from unhealthy bacteria that might have grown in the milk. Food poisoning can be so mild you might not even realize you have it, but it can be severe in some cases. You might develop stomach cramps, nausea, diarrhea or a fever. It can last for hours or days, and you might start to feel the effects of the bad milk within a couple hours of drinking it. 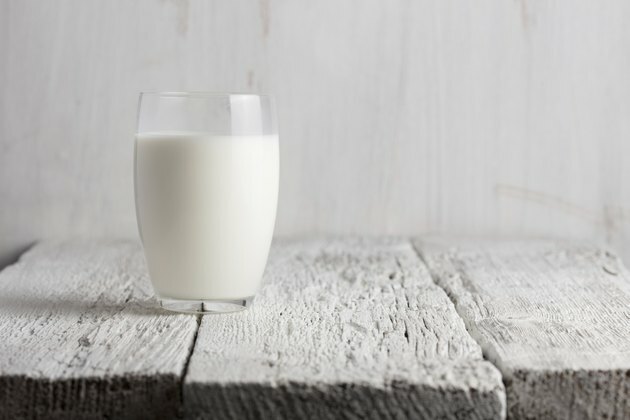 Since raw milk isn't pasteurized, it has a better chance of containing bacteria and can cause serious illness, especially for anyone with a compromised immune system. Fortunately, it's relatively easy to tell if milk has gone bad after its sell-by date. One whiff from the carton or sip from your glass usually will let you know that something's wrong. An unusual texture is another clue it's time to dump the milk down the drain. If you're not sure, don't take the chance and just get rid of it. As long as you drink milk before the expiration date, the types of bacteria that can grow in cooler temperatures should not develop to the point where they spoil the milk. To keep your milk fresh as long as possible, the Dairy Council of California recommends keeping it refrigerated at 38 to 40 degrees Fahrenheit. Keeping milk in its original carton with a tight lid also helps to minimize spoilage. Don't let it sit on the counter for long periods because room temperature encourages the growth of different types of bacteria. Never return unused milk to the original container. When you do that, it greatly increases the chances of contamination from outside organisms. It also helps to keep milk toward the back of the refrigerator, since frequent opening of the refrigerator affects the temperature of products near the door. Can You Drink Milk Straight From Cow?